Cars entering the most traffic-clogged area of Manhattan could be charged $11.52 under recommendations announced Friday by Gov. Andrew Cuomo’s congestion pricing panel. The highly anticipated proposal, released Friday by the governor’s Fix NYC panel, aims to reduce congestion in Manhattan’s central business district while also providing a new, dedicated revenue stream for the beleaguered Metropolitan Transportation Authority. “I think anyone who is in New York City has observed that traffic congestion is crippling. I’ve been monitoring traffic congestion for nearly a half century and it’s the worst it’s ever been,” said “Gridlock” Sam Schwartz, a member of the governor’s Fix NYC panel and former city traffic commissioner, who described the effects of the congestion as “devastating” during a briefing with reporters on the plan on Friday. The recommended payment could either be set up to charge private vehicles a one-way fee of $11.52, or a two-way fee of $5.76 — though the exact dollar amount is considered one option and is not set in stone, according to members of the Fix NYC panel. Those charges are structured to match the tolls imposed on vehicles entering the city through its tunnels. Drivers who enter Manhattan via tunnel would not have to pay twice. The recommendations from the panel do not include tolling the East River bridges or reducing outer-borough tolls. The panel called for similar fees and charges for trucks, taxis and for-hire vehicles like Uber and Lyft. Trucks could see a one-way fee of as much as $25.34 and taxis and for-hire vehicles could experience a surcharge between $2 and $5 per ride, according to the Fix NYC plan. Fees for private vehicles would be implemented at 60th Street, while taxis and for-hire vehicles — using GPS technology that would need to be installed — could see surcharges go into effect higher in Manhattan, at 96th Street. The fees would be implemented in stages, with charges beginning first for trucks, taxis and for-hire vehicles before including private vehicles after a testing period. Ultimately, the fees are the end goal of what the panel billed as a “comprehensive” approach to instituting congestion pricing in New York City — a first for any American city — that could take at least two years to implement. The panel’s proposal could raise between $1 billion and $1.5 billion annually for mass transit. The recommendations include a nine-step approach that could be implemented in three phases. There is emphasis on the need for transit improvements as a prerequisite for any new fees — the idea being that, if the panel is asking more people to leave their cars at home, the MTA must improve its service. A new, 400-acre Brooklyn park and Red Hook subway extension are on the governor’s wish list. Meanwhile, the city must do more to enforce congestion-causing traffic violations and overhaul what critics have described as an abused parking placard program, according to Fix NYC. Instituting the fees would require the approval of the State Legislature, which has already shot down two other congestion pricing proposals dating to Mayor Michael Bloomberg’s administration. Even then, it would take at least two years to institute the tolls, with time needed for planning, design and construction of the necessary infrastructure — similar technology that is currently used for the MTA’s cashless tolling system, which relies on gantries and scanners. The agency plans to purchase 60 additional electric buses upon the successful completion of the 3-year pilot program. In the time it will take to install the necessary infrastructure to support the tolls, the panel hopes that the MTA’s Subway Action Plan will bring some stability to a subway system that has experienced a soaring number of delays in recent years. While unreliable bus service would theoretically benefit from the city’s traffic enforcement actions. 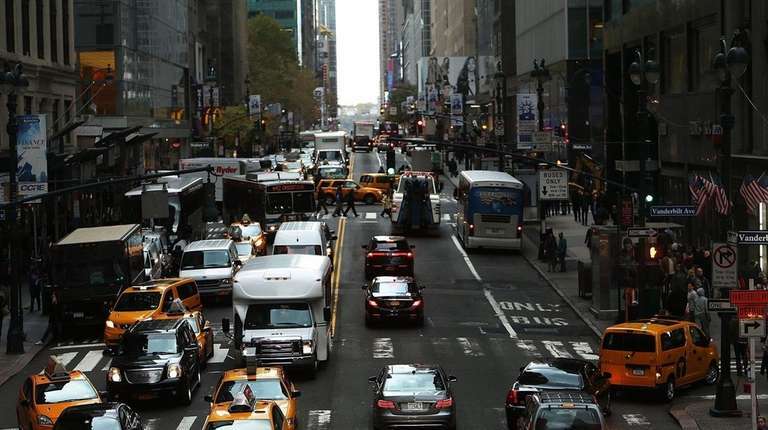 Congestion has intensified in Manhattan for a variety of reasons, including the enormous growth of e-hail companies such as Uber and Lyft; an increase in the tourism industry as well as the soaring population of the city, according to the Fix NYC panel. Traffic moves through Manhattan’s business district at an average of 4.7 miles per hour, ranking as the third slowest in the world, the panel found. That congestion is costing the metropolitan area $20 billion a year, according to a report issued Wednesday from the Partnership of New York City, which has representation on the panel. The plan has been embraced by a number of outside transportation experts as a serious and thoughtful proposal, though it received mixed reactions from elected officials. Cuomo said he was in the process of reviewing his panel’s recommendations, which he received Friday, and will discuss it in the coming months with the State Legislature. “I think this panel did good work,” Cuomo said during an interview on NY1 Friday, but he still expressed concern over equity for outer-borough residents. He also called for a complete overhaul of the current tolling at Port Authority and MTA crossings to make them more reasonable. Mayor Bill de Blasio trumpeted a similar tune Friday — a rare occasion for the often at-odds officials. Transportation advocates and Fernando Ferrer, the MTA board’s vice chairman and another Fix NYC panel member, argued against the idea that the plan was a regressive tax against lower-income, outer-borough car owners. “Nothing could be further from the truth,” Ferrer said. Census data appears to back Ferrer up. The majority of car owners in each borough tended to have higher household incomes than those of car-free households, according to 2015 census data crunched by the nonprofit Tri-State Transportation Campaign, which supports the Fix NYC proposal. Another report from the Community Service Society issued last year found that far more low-income residents are poised to gain from a congestion pricing plan that funds mass transit. Tom Wright, the president of the Regional Plan Association, said that the plan follows in line with other successful congestion pricing systems that have been put in place in cities like London, Stockholm and Singapore. His nonprofit had first suggested implementing congestion pricing in the city back in 1996 and he described Fix NYC’s proposal as an “excellent” starting point, but not one that will solve all the MTA’s problems. “On the one hand, the MTA needs substantial new revenues and this is a big shot in the arm,” he said. “I think there are also [needed] reforms within the MTA that help it be able to deliver projects faster and on budget and prioritize the subway modernization and renovation. I think all of that needs to go hand-in-hand with this. But the governor has shown that he is committed to doing that.